I love Waltonwood at Lakeside. It had storage for your Christmas tree or winter coats in the summer, but it's almost $1,000 more a month, which is a problem. It's beautiful. The people were very friendly, invited us to have lunch with them, and took us all around the facility. I'm handicapped, and they took me all around and made sure I was very comfortable. It was very nice. The staff was absolutely wonderful. I don't have a bad thing to say about any of them. They had apartments and if we could afford it, we'd be there. The food was very good. They invited us for lunch and we sat down and had lunch with them. The people were very nice. However, they were sitting around in chairs sleeping. We're active, busy people and that turned us off. The best way to get to know a community is by scheduling a tour. See the facilities, meet the staff and residents, and get a feel first hand what it's like to live at Waltonwood at Lakeside Assisted Living. Ideally located across the street from the Lakeside Mall near parks, hospitals and a plethora of shopping opportunities, Waltonwood at Lakeside is a luxurious retirement community catering to seniors who wish to enjoy independent retirement living. We also offer individualized care and support for seniors with Alzheimer's and dementia. 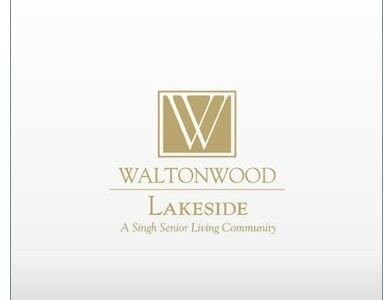 As a Waltonwood Senior Living community, Waltonwood at Lakeside is a part of Singh Senior Living. Family-owned and operated, Waltonwood communities are committed to meeting the high standards of care and luxury our elderly residents have come to expect from the Waltonwood name for the past three decades. Our one- and two-bedroom apartment homes come in a varied selection of layouts, allowing residents to choose the floor plan that best suits their particular needs. Residences feature full kitchens with granite countertops and wood cabinets, one or two ceramic tiled bathrooms with showers equipped with hand rails and benches, and private patios or balconies. Boasting tasteful furnishings and elegant décor, our community is home to a putting green, indoor swimming pool, library with computer center, hair salon, gym, hobby room and games area. A continental breakfast and dinner are served daily in our formal dining room, while snacks are offered in our charming café. Visiting guests are invited to join us for meals and even stay overnight in one of our furnished guest suites. At Waltonwood at Lakeside, we encourage our residents to remain active and engage with our community through our robust calendar of daily activities. From trips to local attractions and religious services to movie screenings and resident walking club, there is always something fun and exciting to do at our community. Residents within our Memory Care neighborhood receive personalized attention from our staff who is trained in caring for those with Alzheimer's and dementia. Activities are designed to encourage socializing and restore a resident's sense of self. Families can rest easy knowing there is an on-site wellness center and a licensed nurse continuously monitoring their loved one. We are dedicated to providing Michigan seniors with unrivaled senior services and amenities so that each day at Waltonwood at Lakeside is filled with comfort and pleasure.